Martha Ullman West, Art Scatter’s chief correspondent, shares some modern and classical moments with dancer/choreographer Rachel Tess and rediscovers that the distance between old and new is often whisker-thin. Dressed in bright blue cotton trousers, running shoes, and a couple of layers of sweaters and tops, backed by an installation of glass canning jars, Tess in a half hour of a capella movement took us in Once a Fool through a soliloquy of rage and regret, gaiety and bemusement, sometimes using jagged angular movement, other times movement as rhythmic and insouciant as an old-time hoofer. Whatever and wherever Tess is performing, whether it is in her friend Paige Prendergast’s Breeze Block Gallery last Thursday and Friday, or at Disjecta during a heat wave the summer before last, she has the presence and confidence of modern/contemporary dancers and choreographers who are far more experienced than she. Or are they? Tess is a Portland girl, who as a child danced Clara in James Canfield’s first Nutcracker for what was then Pacific Ballet Theatre. 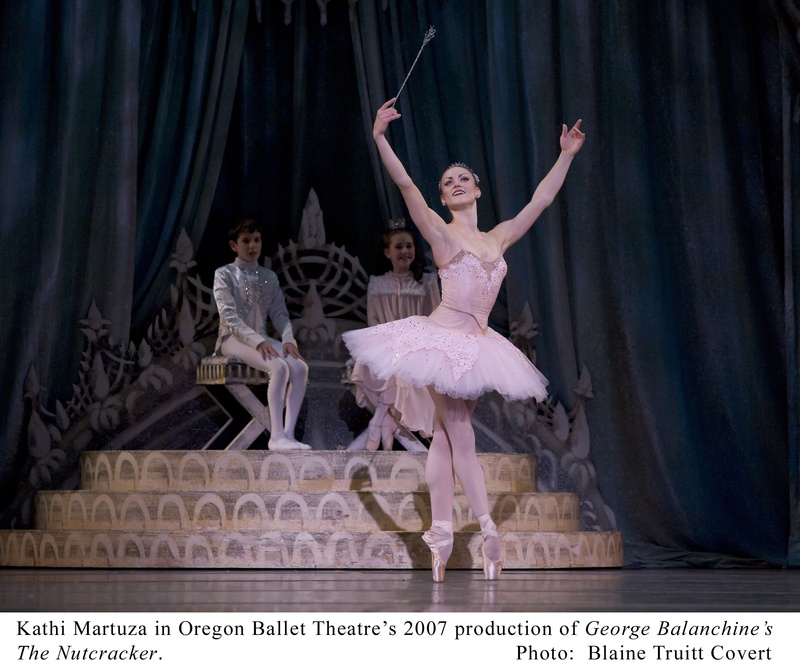 She danced other roles in his second version for Oregon Ballet Theatre (in which Clara becomes Marie, as she is in Balanchine’s version, and in Canfield’s later, beautiful take, in which she’s performed by a small-sized company member, such as Vanessa Thiessen). In the past 10 days I’ve witnessed four performances, three of them easily classified as dance, the fourth, if we must be Aristotelian about this, as physical theater. For my New York colleagues this would have been a light schedule. For me it was pretty packed. Not that I’m complaining — it’s terrific, particularly in these times, that we get to see so much performance in our town. Portland artists are brave and bold, even when the work may not be, and White Bird continues to provide us with dance that ranges from the phenomenal (Baryshnikov and Ana Laguna) to the intriguing (Hofesh Shechter). Let us begin with the Northwest Dance Project, which I attended opening night at the Newmark, on Friday the 16th. In a pre-curtain speech, executive director Scott Lewis stressed the importance of presenting new work, pointing with considerable pride to a program made up entirely of “world premieres” — a term which, like “world class” and pre-curtain speeches themselves, I wish would get lost in the stratosphere. His pride in Dance Project artistic director Sarah Slipper’s new work, Not I, is justified. While I wish I had known when I was watching Andrea Parsons perform this very demanding and emotion-laden solo that the monologue she was dancing to was the uncredited Samuel Beckett’s — and while the video monitor on stage was a bit too reminiscent of Bill T. Jones’s controversial Still/Here, which also dealt with bodies raddled by illness and minds sinking into dementia — Slipper’s jitter-laden, despairing movement has stayed with me. And it’s passed this sure test: I’d like to see it again. Moreover, it was the only piece on this program that had a discernible beginning, middle and end. But new does not necessarily mean good. Nor, necessarily, bad. Except for Not I, the work commissioned for this concert ranged from the mediocre to the ordinary. 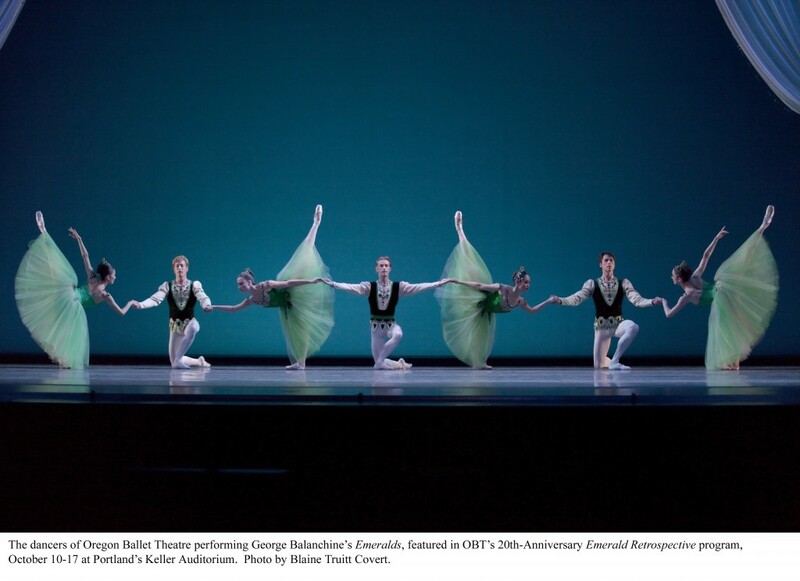 There were moments in the second part of Edgar Zendejas’s Bu Ba Bee when I began to hope he was going to make use of the energy of the dancers in this young company, and he did create a quite fine solo for Patrick Kilbane. But nobody moved much in the three-part work, and what’s more, I never did figure out what any of them was about, or their relationship to each other. The critic was wrong, and she admits it. 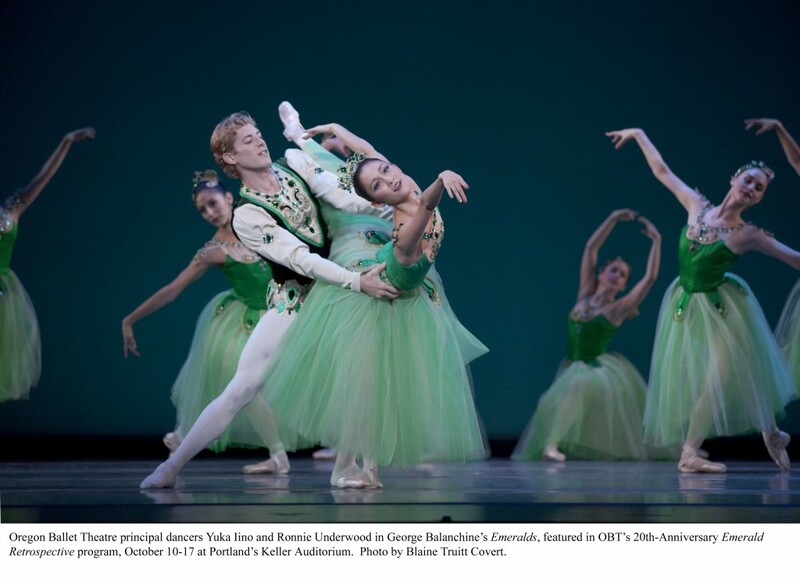 After filing my review of Saturday night’s opening performance for The Oregonian, I went to the Sunday matinee performance of Oregon Ballet Theatre‘s Terpsichorean relay race known as the Emerald Retrospective and was moved to tears by Artur Sultanov’s and Alison Roper’s rendering of the pas de deux from James Kudelka’s Almost Mozart. I still think it’s gimmicky –the dancers never let go of each other as they wend their way through Kudelka’s sinuous and steely choreography; and the costumes, as a friend said, look like an ad for bodybuilder Charles Atlas. However, these dancers’ commitment to Mozart’s mournful music and the anguish expressed by their bodies made me relive some profound personal losses. Is that good? Yes. 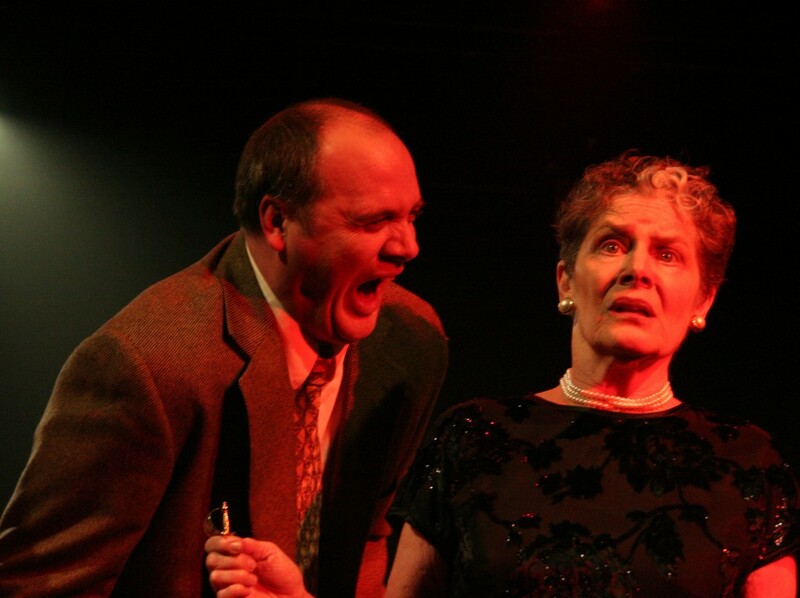 Great performances heal; the Greeks called it catharsis. One of those losses (to the art form I love, and tend to take personally,) was Dennis Spaight, who died of AIDS in 1993, not yet forty. Once a tribute program had been performed in 1994, his work got buried with him, at least as far as OBT was concerned. I hope the bits from Gloria on this program are a trailer if you will for mounting the whole, and soon. Or perhaps Frauenlieben leben, or Theatre Dances, or Rhapsody in Blue — or, if the money can be raised for live orchestral accompaniment, Scheherazade, that luscious, lavish deeply moving re-telling of the Arabian Nights story that has sets designed by Henk Pander, elegantly louche costumes designed by the late Ric Young, and lighting designed by Peter West, whose lighting for Gloria was handsomely reproduced by Michael Mazzola. 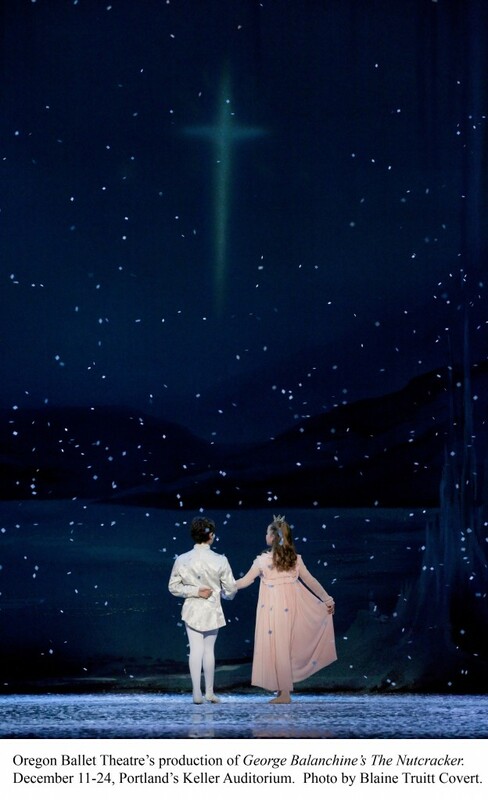 The Eugene Ballet and Nashville Ballet have performed Scheherazade in recent years. 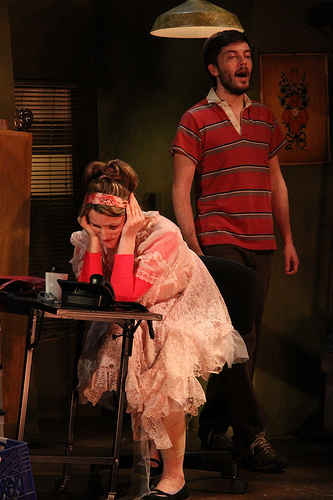 Crayola, parts of Gloria, and Irish Suite have been done by schools around the country. It’s a shame not to have Spaight’s work where some of it was made, and where some of it was polished and changed by the choreographer for specific dancers.